A week ago today it was cold as hell, and I spent most of it outside. 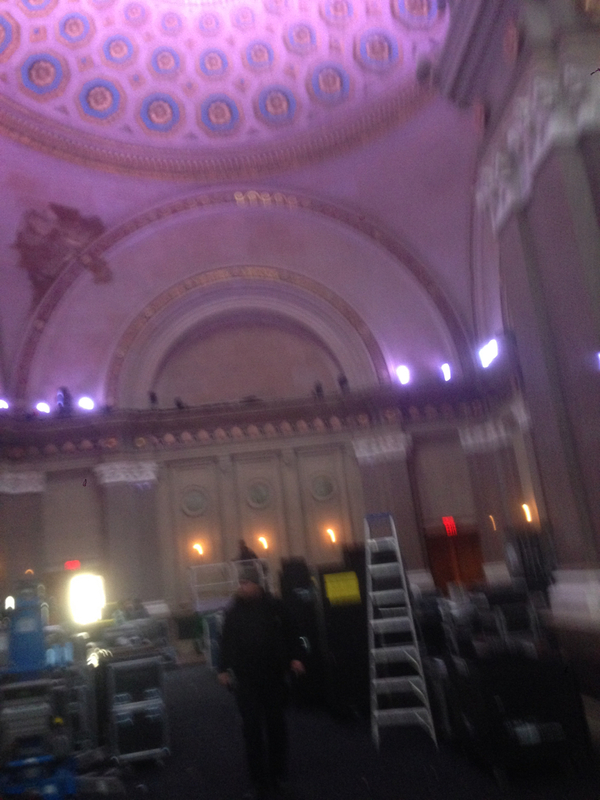 I picked up a nice gig from my friend Van doing a load-out at the Williamsburg Savings Bank on Broadway. It was also the first time over the Williamsburg Bridge since we moved to the city. 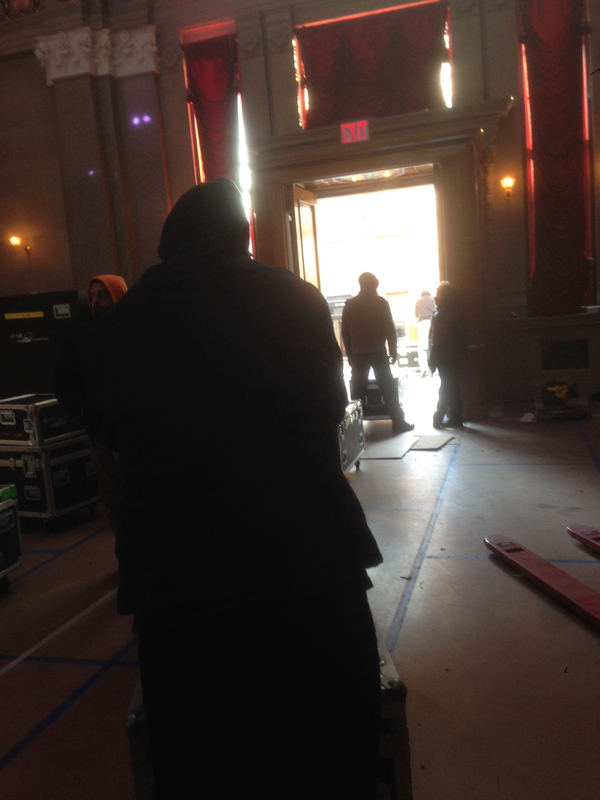 Despite the cold, it was a great experience, my first time working an IATSE job. I was put down as a carpenter, though the only thing I had to do with wood was to carry the pieces of the set out to a truck. I saw the bank from the train as I passed it; saw the huge rigs parked in front and the crew loading them. I got the feeling that I was late, that I’d missed a lot of the action, but there were still 10 hours to go. My friend Van had been there since midnight, I had been willing to show up at midnight but was told to report 8AM on Sunday. 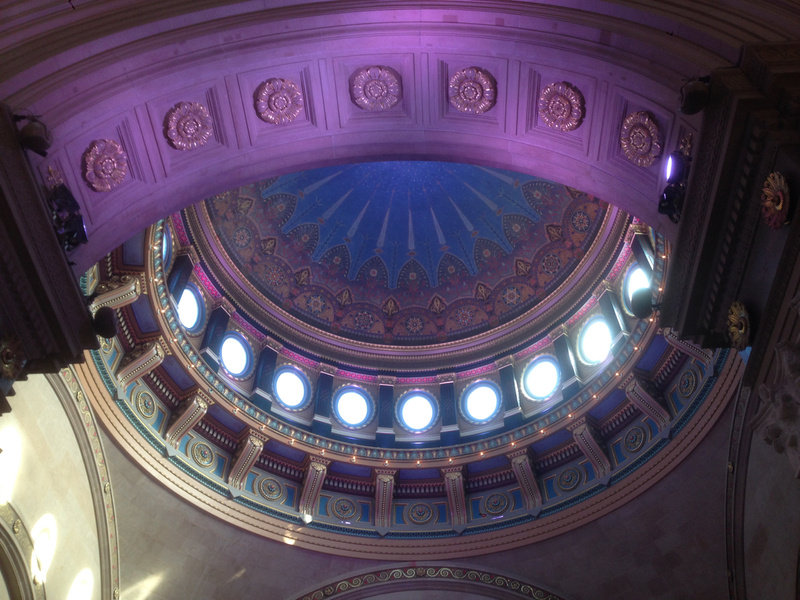 I always wondered what the bank looked like inside, it has a beautiful dome and I would look at it every day as I passed it going over the bridge every day. So Sunday I found out. From talking to the other guys and my friend Van I garnered that whomever owned the building had spent $34 million on the restoration, and it showed. Marble walls, glass, and brass all like it was when the bank was built in the 1800’s. Even the wall sconces were original; they had been gas lamps when the building was new, and now wired for incandescent light. The floor was like a terrazzo floor, except with little mosaic tiles instead of multi-colored pebbles. It was majestic and beautiful, and I was really glad to have experienced it. The work was hard, I started by carrying out the pieces of the set, like I said before, and it was a lot of wood with staples and nails sticking out of it. And I had to do it all wearing a heavy coat, as the doors were open and we had to take all of the wood out onto a platform that was purpose built over the front steps of the bank. The wood was then deposited onto the blades of a waiting forklift, which carried it to a waiting truck. After the wood came the boxes of equipment, dozens of them. We made a line, there were probably 20 of us on the crew pushing and carrying. Some boxes took 2 men to push, others only 1, but it was very well organized, the only times we had to wait were when one of the Semi rigs was filled and we had to wait for it to pull out so a new empty one could take it’s place. 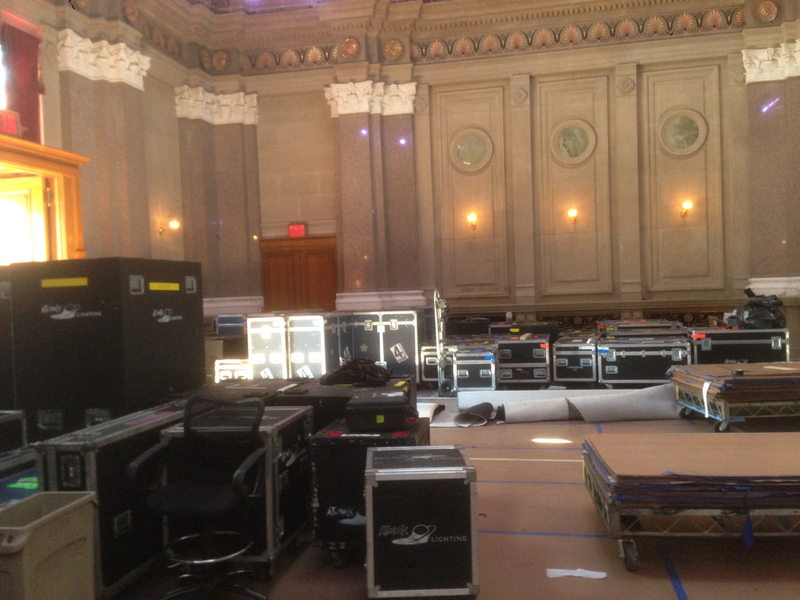 There were also three different companies that provided gear, and the boxes had to be separated onto the proper trucks. I’m glad I didn’t have to deal with organizing that. At 10:30 our foreman, Bill directed me to go downstairs for coffee. We actually had craft services, and the two doughnuts and energy bar that I’d brought along stayed in my knapsack. I had coffee, a croissant, and some cut up fruit. We went back to work, and there were other crews doing different stuff. The event had been some big party and basketball clinic sponsored by Nike, it was to promote $400 sneakers to kids that can’t afford them. Nike must be doing pretty well at that because the bill for the stagehands alone had to be astronomical. There were these custom made backboards with hoops and nets; three of them; and whatever production crew had put them up were taking them down. We were instructed not to touch their stuff. That crew were all young college kids, hip boys and girls with scene hair, knit watch caps and screw guns hanging from their belts. My crew was mostly all men, and even our young guys were blue-collar “Carhart guys.” Needless to say, there was some tension between us. The word “scab” was bandied about under breath. At 2 lunch was called, and by then Van had gone home along with all the others that had been there since midnight. I ate lunch alone while I did my crossword, not knowing anyone else. Then it was back to work. I wish I had stop motion footage of the whole thing, because when I got there the huge main hall was filled with equipment, and there was wall to wall carpeting on top of Masonite covering the whole floor. After the equipment was cleared we started cutting up the carpet and taking it out on the platform. There was a 20-foot Ryder box truck picking up the carpet. One guy in his 40’s with a big sheepskin trapper hat supervised two college kids in loading up the carpet. Then came the Masonite, which we loaded onto giant 4X8 dollies. These where picked up by the forklifts and loaded onto the trucks. All very efficient. With the building cleared, the last hour was spent outside in the 10° air taking down the platform. When we were done it was like we had never been there. But I’ve got the pictures to prove we were. And the next day I had the bruises and muscle aches to prove it too. 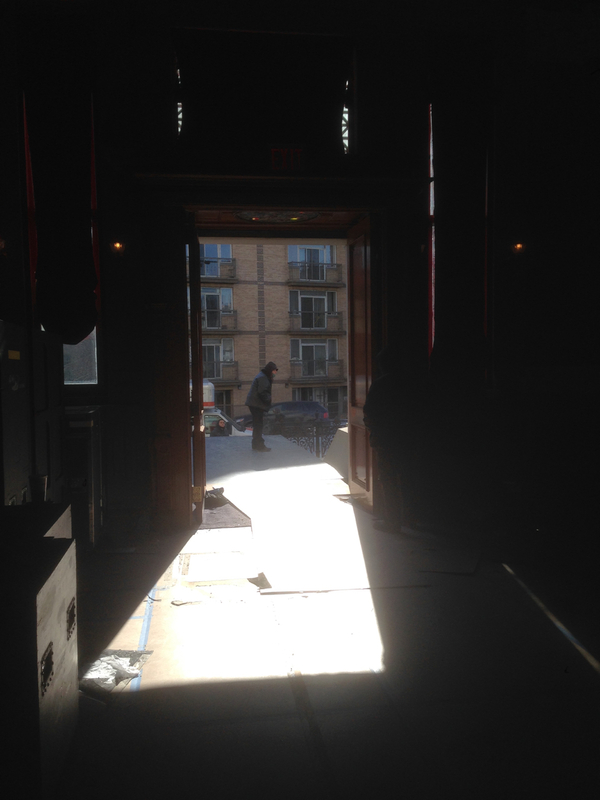 This entry was posted in Uncategorized and tagged beauty, bule collar, Carhart guys, gattitude, loading, Nike, production work, restoration, trucks, unions, Williamsburg Bank Building, work. Bookmark the permalink. It’s amazing all the different jobs you have and the willingness to do each one with integrity.